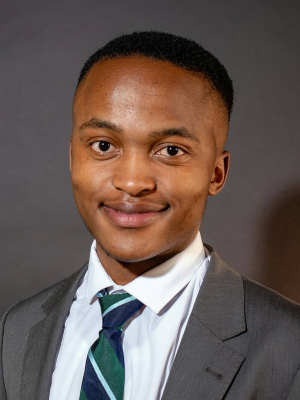 At just 21 years old he’s already started education-based initiatives that have raised over R600 000 in three years and writes and speaks on international platforms with global shapers and change-makers. Here's his story. At just 21 years old he’s already started education-based initiatives for students that have raised over R600 000 in three years and writes and speaks on international platforms with global shapers and change-makers. In 2015, he founded an organisation called Let's Apply South Africa, which aims to identify deserving underprivileged scholars in primary school with the potential to excel at top high schools. Obakeng Leseyane has even given a TedX Talk about his journey, titled Enslaved by Poverty, Education was My Liberation. But he never thought he’d achieve any of these things – in fact, he always thought he’d end up a taxi driver. It’s a chilly day in Johannesburg when we meet Obakeng at a coffee shop in Braamfontein. He walks in wearing a jacket, scarf and a hat – standing almost as tall as the door frame of the establishment, his big eyes scan the room looking to put a face to the name he’s been in communication with prior to this interview. “I had to look through Instagram to find how you look so it’s not hard to spot you,” he giggles. “Hi, I’m Obakeng, thank you for telling my story,” he continues politely. “Growing up I always thought I’d end up as a taxi driver because most of the men around me were either taxi drivers or mechanics, and, I mean, I wasn’t too opposed to that idea because my uncles seemed to always have money – and girls loved them,” he laughs. Obakeng’s mother was only 16 years old when she had him, meaning she had to drop out of school to make sure her son was taken care of. “My dad was nowhere to be found, so my mother worked odd jobs here and there to take care of me – my grandmother also helped,” he says before sipping his hot chocolate. His eyes widen and he smiles as he tells his story of growing up in Rustenburg, North West. So one day, when Obakeng was in Grade 4, he attended a community gathering where the king addressed his village (which formed part of his kingdom), and little did Obakeng know that that day would change his life. “Before his speech to his people, the king asked a rhetorical question but I didn’t realise it. So I put up my hand and shouted from the back that I know the answer. He then asked me to go to the stage and give him the answer – he put the mic in my face and I gave the answer to the question,” he chuckles. “And, I mean, I was a young boy then whose mother couldn’t afford a lot of things like ice cream on hot days, for example. That day also happened to be quite hot, and all I could think of was ice cream, but I opted to ask for something even better – an education,” Obakeng tells us. “I asked the king to take me to a school where I would learn to speak English. And that was important to me because from a very young age, I knew that only education would liberate me and my family. Only education had the power to restore dignity to us, and I wanted to do that for my mother and grandmother, and all their sacrifices,” he says. Two years later Obakeng was invited by the king’s office to accept a scholarship and entrance into one of the best private schools in Cape Town to start his high-school studies. “We had a lot of aptitude tests and all of that stuff, and I never thought I’d actually make it because everything was in English and I wasn’t able to even comprehend the language, but I made it and was soon on my way to Cape Town, on a plane, something I had never imagined for myself,” he recalls. And even though it took him a year to adjust to the culture of his new school, he rose to the occasion and made a name for himself – making his mother, grandmother and younger sisters proud too. After matric Obakeng earned his way into the African Leadership Academy in Roodepoort, where he honed his leadership skills and was ultimately appointed to be the director of administration for the ALA Model African Union 2018. His keen interest in international affairs and diplomacy also led him to participate in Model United Nations conferences in South Africa and abroad. Now, Obakeng wants to improve the education system in the country, especially for young black people who come from marginalised communities, like his own. “Education is what liberated me and family from poverty and I believe that it should accessible to all, and not only the rich. And even for those kids who find themselves in white schools and spaces – they have a right to a healthy and safe environment that fosters learning and growth. Black people should not be made to feel as if they’re being done a favour by getting a good education,” Obakeng tells us. “We need to work together to make our future bright, and the only way to do that is to make sure the youth is equipped to lead and take on those roles with confidence. That’s why I want to be the president of South Africa in 2039,” he says before dashing off to his next meeting.